There are lot of traditional dishes which are cooked in Himachali kitchen.With the modernization of food habits these dishes are on the verge of disappearance. 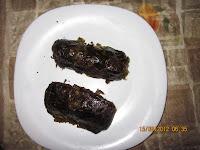 One such dish is 'Patrode'/'Patode' or sometimes called 'beth'. Recipe:Soak Rice , Chane ki dal,dale mah overnight.Prepare a paste of Soaked rice,Soaked chane ki dal, soaked dale mah, salt(as per taste),Haldi(turmeric),Garam Masala,Dhania powder, green chillies, 4-5 tea spoons of mustered oil, pomegranate seeds or amchoor(Optional) either in a mixer-grinder or on a sillbatta (If you didn't get time to soak rice,chane ki dal and dale mah then as a quick alternative you can use Gram flour). Place some thing at the bottom of the pressure-cooker. Add 1 and ½ cup of water and 1 tbsp of oil to water and steam cook the above chunks till three/four whistles. Let it cool for about 15-20 minutes. Remove the threads and cut it into two pieces. Serve it hot with desi ghee spread over it or deep fry these small pieces. And serve it with chatney or tomato sauce. Pour some mustered oil in pressure cooker or in some deep pot having lid and thick base .Cook these chunks on low gas for approximately half an hour or till these chunks get fully cooked .Make sure to displace chunks after a gap of 4-5 minutes so that these get cooked from all sides.Serve them hot with deshi ghee,sauce or chatney.